I used to (and still do, to a certain extent) be critical of everything salad. Iceberg lettuce is full of water, what’s the point of eating it? How hard can it be to make a good salad? Just throw some ingredients together, pour dressing, and toss. Why eat a plateful of raw spinach when you can sauté it up with garlic? Only in this past year have I been able to really appreciate a good salad. One with fresh and flavorful ingredients and a refreshingly crisp dressing. In fact, during lunch, sometimes I even find myself ordering salads as a meal (gasp!). Now, what has catalyzed all this ridiculousness? It’s a little something called “my body is getting older and I can’t scarf down oodles of food now and magically wake up with a flat stomach.” Reality can be harsh. I feel like I’m a pretty healthy eater (during the weekdays, at least), but in an effort to become even more healthier, I’ve been looking more and more into salad recipes. 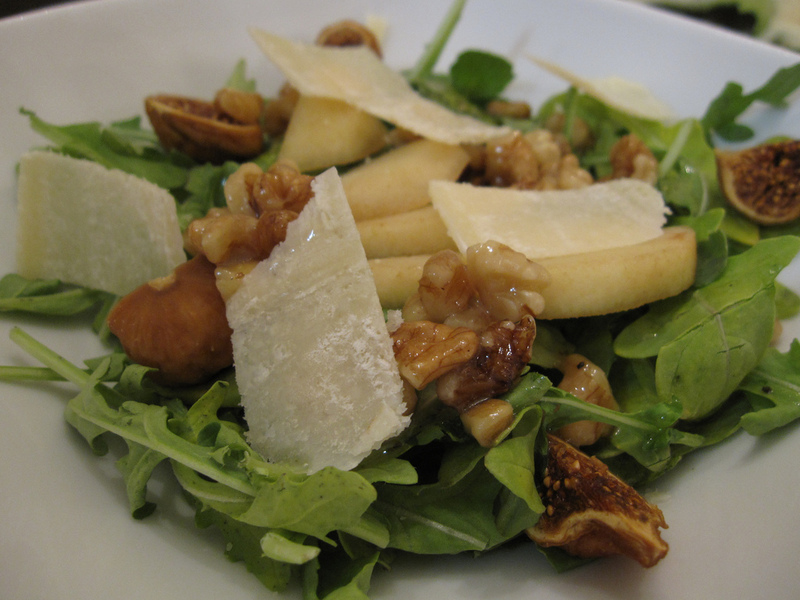 Some of my favorite ingredients in salads are figs, candied nuts, and fruit. The salad below incorporates all three. Caramelized walnuts: In a sauté pan, heat 1 cup of sugar and 4 tablespoons of water over low heat. After the sugar melts, mix in 2 tablespoons of butter and let thicken. Add 1-1.5 cups of walnuts and mix in 2 ounces of honey. Place on sheet pan and let cool. Lemon vinaigrette dressing: not sure of the exact measurements, but I started out with 1 teaspoon of Dijon mustard, 1 teaspoon of honey, 1 tablespoon of lemon juice, S&P, and whisked in olive oil. Adjusted the ingredient proportions until taste. Verdict? I still feel like a cow grazing grass (uncooked leaves), but at least I’m a healthy one.